I am excited when I got an email from sampleroom and they have Celeteque stocks at that time. I hurriedly turn on my pc to have a look at the sample but knowing that it is "Celeteque" I feel the guts to have my first purchase now since this will be useful to me and not harmful while I'm pregnant. I am also eying a lotion since I felt like my skin is dry and lacks moisture but I have to make sure there's no chemical in it. I was really excited to the fact that I worried too much when the status of my order is still pending when in fact I already paid for the shipping fee right after I check out. But I still got it! 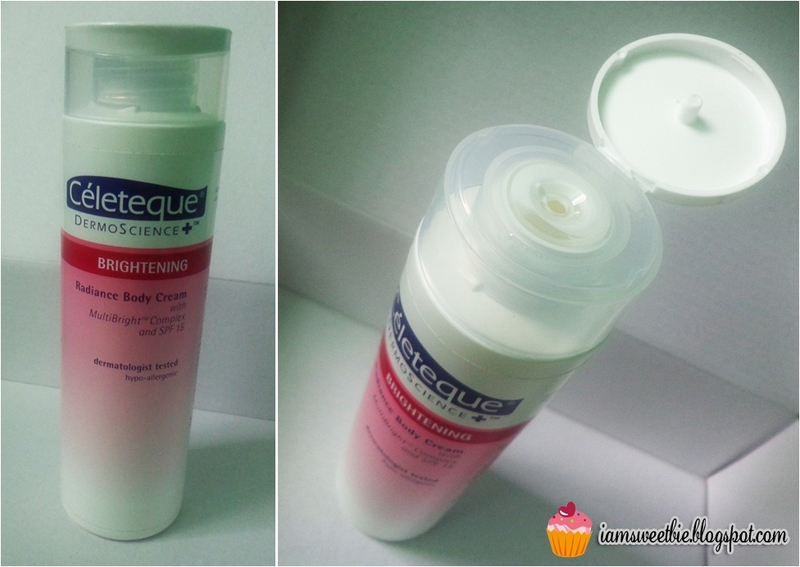 This is my first Sample Room purchase and they sent me my order "Celeteque Brightening Radiance Body Cream" in full size, 200 mL which costs Php 270 but I only have to pay for the shipping fee worth Php 130 so still, I save half of the price. So it is a win-win for me because I don't have to spend 200+ worth of money to buy this one, instead I just opt to try it first and see myself the result before actually buying the product. Inside the parcel was the product which is sealed in this cute enveloped stamped with the Sample Room logo and sealed with a Sample Room sticker too! 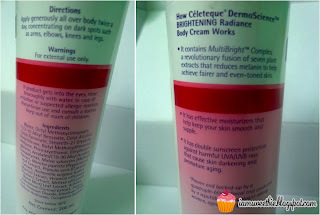 Celeteque Brightening Radiance Body Cream contains Multibright Complex which reduces melanin to help us achieve a fairer and even-toned skin. It also has moisturizers that keeps the skin smooth and supple. It also has sunscreen protection, SPF 15, that will protect against harmful UVA/UVB rays that cause skin darkening under the sun exposure. It is also unscented! The direction and how it works is written at the product label. It is a must for me that I should read the label first when I buy products I haven't tested before. I have to be extra careful to avoid the harmful ingredients that may affect my pregnancy. Just like when buying a food, you should always check the label and the manufacturing date/expiration date to avoid mishaps afterwards. It is creamy enough and not greasy when applied. It is easily absorbed by the skin and it is not watery nor sticky at all. Like what it is said in the instructions, I applied it to my skin concentrating on the dark areas such as elbows and knees. If my elbows and knees will lighten after using this one, then this is really a good choice and I will really buy it next time. It leaves my skin smooth and fair, even notice that it lightens already upon applying it. I can't help but smell my skin from time to time! What I just don't like about this product is the bottle lid when I open it. It's a bit loose for me. But other than that I love the product itself. Thanks Sample Room! You too can have a chance to try out this product! Just visit their website and sign up!